To build a golf course and surrounding community anytime after the 2008 recession, a developer either had to be dumb or very organized. Put Compass Pointe developer Bobby Harrleson in the “organized” camp. At a time when virtually everyone not invested in a golf course or golf community is preaching gloom and doom for the golf industry, it takes guts and confidence to build a golf course, let alone an entire community with golf as its central amenity. The 79-year-old Mr. Harrelson has plenty of both and something that counts for even more –- experience. Over a five-decades-long career, he has built and/or managed 100 communities of varying sizes in the Wilmington area, including Leland, NC’s Magnolia Greens, with 27 holes of golf. Magnolia Greens is located just across Highway 17 from the much more aggressively marketed and successful Brunswick Forest. Architect Rick Robbins saves much of the drama on the Compass Pointe layout for the 18th hole, a par 5 that forces a final wedge over an expanse of marshy flora. Homes are well beyond the field of play at Compass Pointe, separated in some cases by water and in others by trees on the former paper company's property. Although Compass Pointe is open to people of all ages, except for an area of more than 100 single-family homes restricted to persons 55 years and older, just a handful of families with children live inside the gates; and more than 90% of residents are year-rounders. The community’s amenities seem geared mostly to the retired residents, especially at the Grand Lanai beside Cardinal Lake. The amenities there include a Wellness Center with a constant rotation of classes for the body and mind (yoga, aerobics, painting), rows of fitness machines, a spa, and a massage therapist available on an appointment basis. (During my visit, I noted that a couple of dozen people were taking a painting class.) The Grand Lanai, which also features cooking stations and a huge screen TV for major sporting and other events, opens onto a large pool area and a canoe and kayak launch beyond. Mr. Harrelson’s plan has been to roll out one big new amenity annually, and he has been true to his commitment since opening; this year’s big amenity was the golf course, which opened in June (see below). An indoor pool is scheduled for next year, along with a “lazy river” that will appeal to children from 9 to 90. 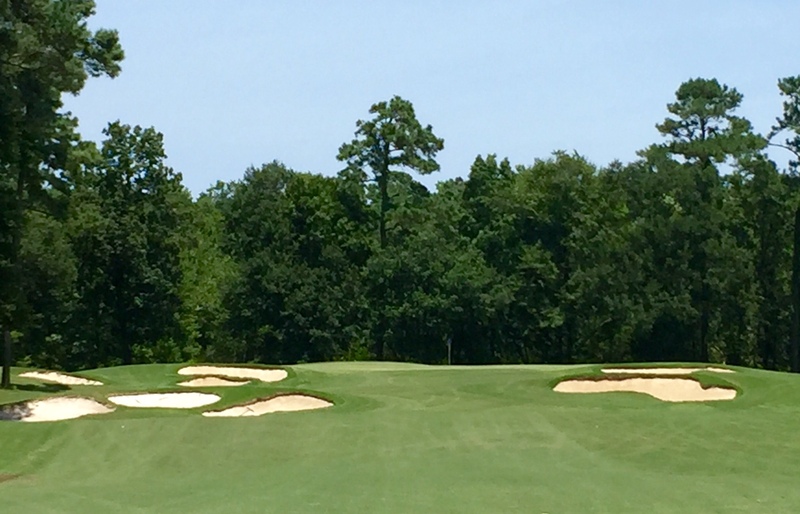 For a $4,400 annual membership, golf is available not only at the 18 hole Compass Pointe course but also at the 27-hole Magnolia Greens layout 10 minutes away. real work on the generally flat Compass Pointe course are the greens which are mostly large, undulating and, in a few cases, puckered up to make them tough to approach on a roll. Since the course is just a few months old, the greens are still extremely firm -- although not fast -- so much so that any front pin position on an elevated green should be considered unfair, since holding even a wedge shot where it lands is nigh impossible. (Thankfully, there were just one or two pin positions up front on the day I played.) There are eight layouts at Compass Pointe, if you count the three "hybrid" tees; these alternate among the Blue, White and Yellow tee boxes to form slightly different distances. Residents like Craig Park, who was my partner for the round, find a lot of fun in having the ability to score well at Compass Pointe. They also appreciate the membership plan at the semi-private club: No initiation fee and just $4,400 annually to play as much golf as you want; and that includes the 27-hole course at Magnolia Greens, which Mr. Harrelson built in 2000, sold and then re-purchased two years ago. Forty-five holes of golf at less than $400 per month (and no initiation fee) is a strong lure for those planning to play a few days of retiree golf every week. If you play the correct tees at Compass Pointe, you should never feel threatened by the hazards between tee and fairway. Compass Pointe is eight years old. When Mr. Harrelson first began selling properties, land and home packages were priced in the $200s. Today, prices begin at $400,000 and new owners are opting in every week. Craig Park, who is a native Californian, told me he and his wife Louise had looked at all the golf communities in the Wilmington area and as far south as St. James Plantation, about 45 minutes away. “But when we came through the gates of Compass Pointe,” he said, “it just seemed to be exactly what we wanted.” Craig and Louise have since built a house and moved in full-time last January. Like what you've read? Please contact me if you would like more information about Compass Pointe or to arrange an introduction. Someday, soon I hope, I will activate a web site I have owned for a few years called “Off The Beaten Cart Path.” Although it sounds representative of golf courses at significant distance from major cities, I really intend it to be those courses that take at least a little effort to reach. 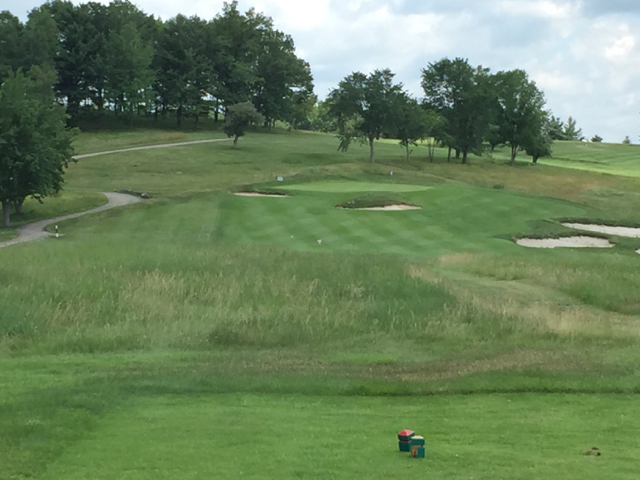 The Golf Course at Glen Mills in Thornbury, PA, would certainly make the grade. 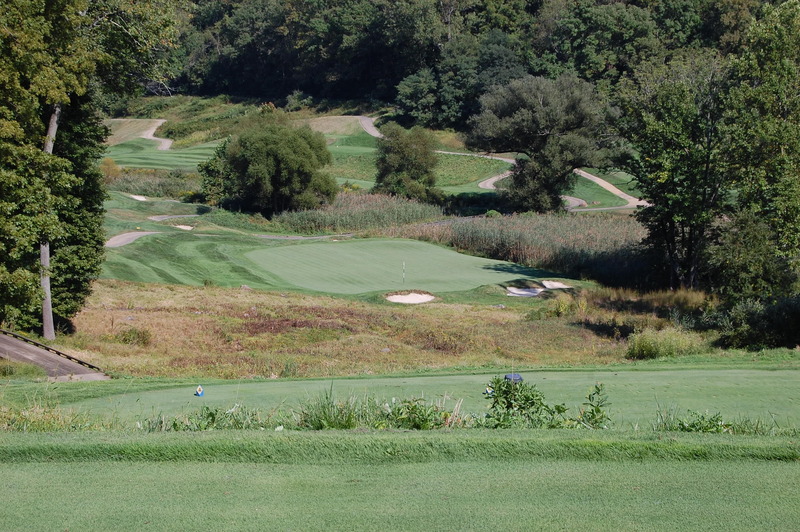 Ranked recently as the fourth best public course in all of Pennsylvania and located about a 40 minute drive from the Liberty Bell in Philadelphia, Glen Mills, nevertheless, feels as if it is in East Podunk. You pass family farms on the way there and, just before you reach the turnoff to the course, a beautiful school set on a rolling 800 acre campus. The Glen Mills Schools opened in 1826 as the Philadelphia House of Refuge for Boys, and today serves boys ages 15 to 18 identified as “juvenile delinquents,” many of them gang members. In fact, the school recruits some gang members and uses elements of gang social structure to exert peer pressure and structure rewards. No one is permitted to make physical contact with their fellow students. Most interesting, perhaps, is that the young man at the golf course bag drop who greets you or the person who takes your order for a hot dog at the snack bar is more than likely to be.a student at Glen Mills. Indeed, one of the golf course’s reasons for being is to provide opportunity to Glen Mills students for work while they straighten out their lives. Graduates of the golf course’s extension program have gone on to careers as golf club superintendents and turf management instructors. The Glen Mills Schools just beyond the Golf Course at Glen Mills. Straightening out your drives is not the biggest challenge on the golf course at Glen Mills where the fairways are extremely generous. I did not play well but still managed to hit all but one par 5 and par 4 fairway. The trouble is generally on and around the large and undulating greens where Robert “Bobby” Weed exhibits a bit of the sly fox of his mentor, Pete Dye. Glen Mills is one of those golf courses where pin positions can mean the difference between a pleasant walk and a spoiled one. We found a few positions atop ridges, or close enough to give extra pause on approach shots and a few where it was tough to identify the right spot without driving all the way up to the green. A few pins were tucked just beyond bunkers at the bottom of slopes, necessitating a play away from the bunker and to the middle of the large greens (never a bad play but where’s the fun in that?). But all in all, even with a few blind shots, Glen Mills is a fun experience. 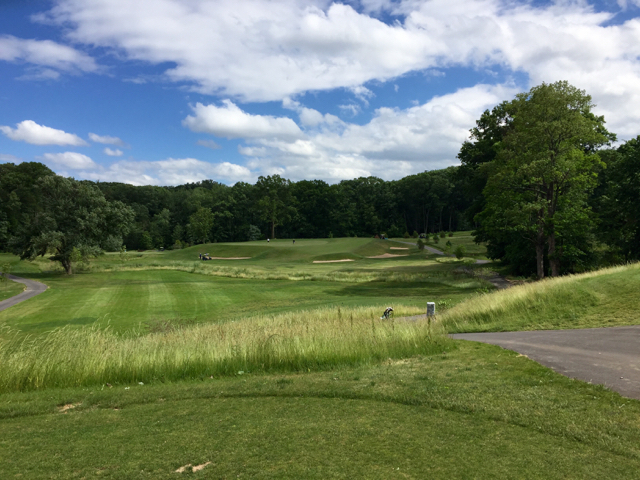 If you ever find yourself off the beaten cart path southwest of Philadelphia, make sure you devote four hours to a round at the unique Glen Mills. A downhill par 3 at the Golf Course at Glen Mills. While doing a search for a customer today, I happened to check through the listings at Colleton River Plantation, an upscale golf community in Bluffton, SC, that suffered a crash in home and land prices during the recession. Overzealous purchasing of lots that sold for as much as $400,000 just before the recession left some residents looking to dump those extra lots at ridiculous prices from 2009. The definition of “ridiculous” was $1. 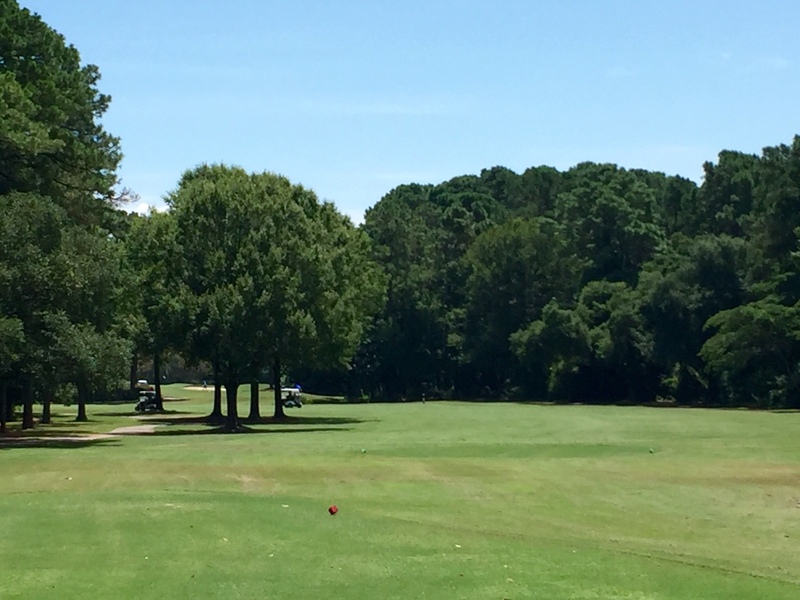 The reason for the crazy pricing is that golf membership is mandatory at Colleton River, as it is at its fine neighboring golf communities of Berkeley Hall and Belfair Plantation. 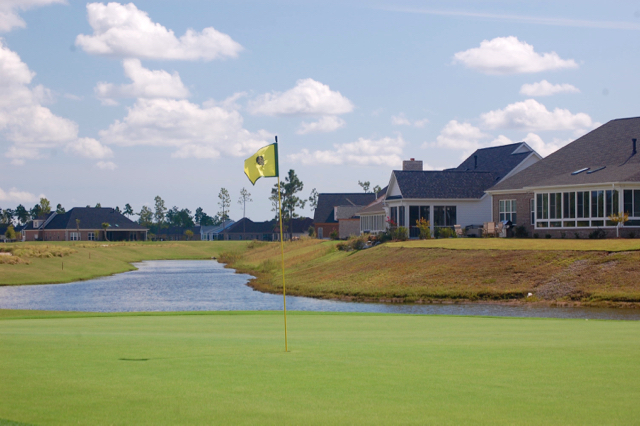 Even if you own a home in these communities and purchase a lot, you must commit to a second golf membership with an annual dues obligation approaching $20,000 (including the homeowner association dues and other assessments). The 45 holes of Pete Dye and Jack Nicklaus golf are about as good as you will find inside the gates of any golf community, but there are no mulligans for that extra obligation. Once you commit, it is like the Roach Motel: You can check in (for membership) but you can’t check out until someone buys your lot. Colleton River Plantation in Bluffton, SC, features 45 holes by Pete Dye and Jack Nicklaus and almost a dozen home sites priced at just $1. My customer is looking for a home priced up to $500,000, and I figured that, post recession, there still might be a selection of homes in that range. Boy, was I wrong; there are no homes currently for sale below $539,000 in Colleton River. That caused me to assume that the Colleton market has risen dramatically overall, and that those $1 lots were long gone. But when I scanned the list of current lots for sale, there were 11 priced at $1, and some of them were beautifully sited. Here’s a description of one that is over a half-acre in size: “Long panoramic golf views of the 2nd fairway of the fabulous Dye Course...Seller will pay the Colleton River Initiation Fee and balance of 2016 Dues.” In other words, the seller is giving you something like $20,000 (in value) to take his nice piece of property off his hands. About $200 per square foot in construction costs should get you a nicely outfitted brand new home, or a total of $500,000 for a 2,500 square foot house. Sorry: Make that $500,001. Is Now a Good Time to Time the Market? At first blush, August real estate sales in the Wilmington, NC, area, seem like an anomaly, but the numbers imply this may be a good time to buy a home inside or outside a golf community in the area. Year over year sales for the month of August leaped by 30% in New Hanover, Pender and northern Brunswick Counties, which surround Wilmington. But –- and it is a big but -– median prices decreased more than 5% according to the area’s MLS (multiple listing service). Average sales price of a home in the region reached $260,000 in August, although the median price dropped to $206,000. The conclusion one can draw from those two numbers is that a disproportionate number of expensive homes sold during the month. Those contemplating a vacation home in Myrtle Beach certainly have evidence that condo prices have begun to rise after years in the doldrums. prices plummeting have seen their home values increase enough in the last few years that they are selling and moving on. In the coming months, these post-recession sellers will have totally exited the market and the number of homes for sale very well may drop. And that always means a rise in prices. Down the coast in Myrtle Beach, which holds strong appeal to vacationing families and golfers, single-family homes and prices dropped in the July to August period by 6.5% and 4.5%, respectively. But the prices of condos increased by 1.5% to an average $120,000 and the number of condo units sold increased by 8.35%. In Pawleys Island’s Pawleys Plantation, for example, with a fine Jack Nicklaus golf course at its core and the beach just a five-minute drive away, the lowest priced condos have risen from around $125,000 to $200,000 in just the last year. Those who have been contemplating a vacation home in the Myrtle Beach area have enough evidence that prices are rising after years of price erosion in the area’s condo market. On the other hand, folks who are interested in a single-family home in the area will find some bargains in advance of the winter, when those who visit the Grand Strand from Canada, New England and other frigid places generally warm to the idea of a retirement home in the coastal South. Please contact us if you are interested in more information about Southern real estate. I am resigned to the fact that I will never hit a 90 mph rising fastball, sink 10 free throws in a row, or kick a 40-yard field goal –- with or without a line of 300-pounders rushing at me. But at age 68, I fully expect in the coming years to conquer one of sport’s enduring challenges for rank amateurs –- to shoot my age in golf. That will happen only if I play from tee boxes appropriate to a game that no longer includes 230-yard drives (unless a rare solid strike comes while I am pointed downhill and with a strong wind at my back). The 400 yard par 4 holes have become like par 5s for me, especially into the wind. a gully at mid-green creating two distinct levels that makes putting from one to the other a nightmare. A couple of those 400+ par 4s played into a prevailing 10 mph wind last week. On the back nine, the par 4s from the blue tees are all under 400 yards, but the longest ones, at 393 yards and 383 yards, still force a long iron or hybrid to greens with false fronts and extremely firm surfaces. My shorter distance off the tee boxes is mostly about slowing club speed, and that also makes it unlikely I will spin a mid- or long-iron approach on a firm green. For my first round from the white tees, I shot 79, one of my lowest rounds of the year. That score, and the specter of having a decent chance of par or better on every hole, reinvigorated my love of the game. On reflection, I identified a total of eleven wasted shots from badly struck chip shots, three-putt greens, poorly judged approaches and even one shanked short iron. My 79 minus those 11 strokes would have resulted in a 68. The dream of someday shooting my age is very much alive thanks to understanding my limitations and, literally, a bit of forward thinking. Last week I read yet another poorly researched and stupid article by a real estate writer predicting the doom of golf communities. 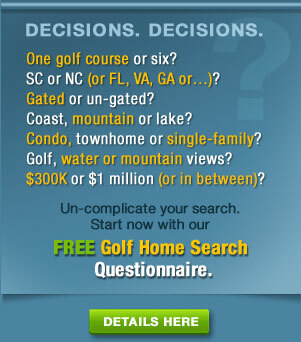 He used, as evidence, one golf community owner in Arizona who wants to plow over his golf course and build more homes. Nowhere in the perfunctory article is there any discussion about extenuating circumstances or whether the golf course was managed properly or poorly. Lost also in the media’s fascination with the alleged death of golf are the stories of long-established golf courses that have undergone significant restoration and renovations -– which brings us to Keney Park, located at the extreme north end of Hartford, CT. The park itself opened in the late 19th Century when the city was arguably the wealthiest in America, thanks largely to being the insurance center of the nation. 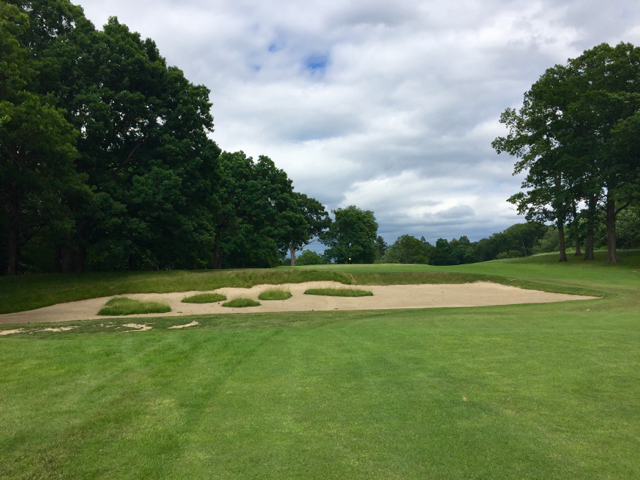 The church pew bunkers beside the 8th green at Keney Park and adjacent to the 7th tee box are reminiscent of the more famous set at Pittsburgh's Oakmont Country Club. The park’s golf course, like Keney itself, has great historical value. Devereux Emmet laid out the first nine holes, which opened in 1927, and the second nine were added by a member of the city of Hartford's engineering department in the early stages of the Great Depression in 1930. (The engineer, Jack Ross, also designed the other city course in Goodwin Park.) Ironically, the Depression spurred the construction of the brick clubhouse that was finished as a national public works project in 1934. (It is currently being restored and should be ready for use next spring.) Emmet, who designed more than 150 golf courses worldwide, maintains a strong reputation in golf architecture circles, and is responsible for the layouts at Congressional Country Club outside Washington, D.C., and Leatherstocking Golf Club in Cooperstown, NY. The designer was especially prolific in the Hartford area and is credited with 18 of Hartford Golf Club’s 27 holes and the layouts at Country Club of Farmington and Manchester Country Club. One of my favorite classic courses, Copake Country Club, just over the Connecticut border in New York State, is an Emmet design. Keney began as a private park on farmland owned by a never-married wealthy local businessman, Henry Keney, whose cousin encouraged him to leave his name on something that would endure. His will provided not only the land but also funds for the park, laid out and landscaped in the 1890s by the famous Frederick Law Olmstead’s company. (Olmstead was a Hartford native.) 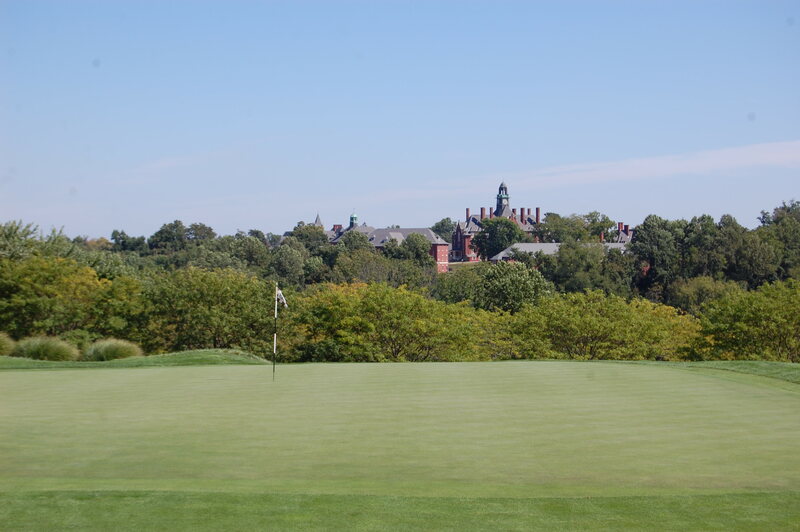 The park and the golf course were immensely popular, first with wealthy north Hartford residents in the early 20th Century and later by a more diverse population of mostly Jewish and African-Americans. In later years, many of the area’s white residents left for the suburbs; most of Keney’s neighbors today are persons of color, many of them immigrants. The play on the par 5 10th hole at Keney Park is to lay up just short of the fairway bunker 130 yards from the green, and take your chances that you will be able to hit past the green's false front. In the 1970s, Keney Park fell into disuse despite its pedigree and beautiful grounds, as Hartford itself became one of the poorer cities in the nation. The park’s secluded areas, once considered a lure for visitors, scared many people away because of the possibility of criminal activity. The area’s residents, with the strong support of Hartford’s police department, rallied to Keney’s defense, and by the mid 1990s, things were looking up for the park. Nevertheless, conditions on Keney’s golf course had deteriorated after the turn of this century, and the nail in the coffin was the hiring of a company whose management of the club, if not criminal as some alleged, was certainly inept at best. Trees and fallen limbs littered the golf course, and the old line about a “cow pasture” would not have been an inappropriate description of the fairways and greens. Thankfully, city officials were shocked enough at the conditions to fire the management company in charge of the club and authorize the $5.8 million needed to restore the golf course to Emmet’s original specifications. Construction began in 2013 under the guidance of a firm headed by Ken Dusenberry and with input from Brad Klein, the golf architecture critic for Golfweek magazine, and the course reopened in April this year, albeit with the pro shop located in a trailer and no potable water available on the golf course. (A local catering company offers food and drink from a food truck parked near the clubhouse.) Golfers won’t care about the temporary lack of amenities; I have now played the course twice this year with friends, and all of us believe it to be the equal of most private courses in the area and as good as any public layout in the state. The par 3 13th hole at Keney Park is 188 yards long from the tips, with trouble to the left and behind the elevated green. Bill and I agreed there was only one "odd" hole, the par 5 2nd. It played to 491 yards from our Blue tees, but moderately long hitters will leave driver in their bags and opt for a 5-wood or long iron to stay short of a stream that bisects the fairway. Fans of par 5s of less than 500 yards will be disappointed in a lay up drive that will leave little chance of chipping or putting for eagle. 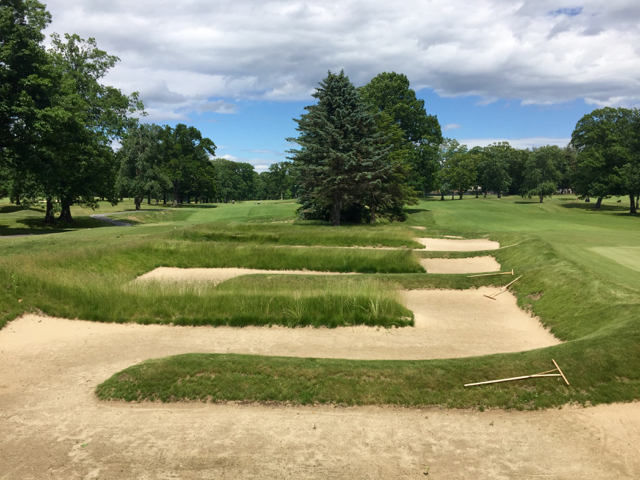 That hole, and a few off-fairway areas that are sparsely grassed, are minor quibbles with a golf course that is about as much fun to play as any in the northeast. And green fees are a bargain, especially if you are a Hartford resident ($27 weekday, $28 weekend) or a non-resident “senior” ($27/$38; the course’s website doesn’t specify what age constitutes senior but I did not get carded). Non-residents of a younger age pay just $37 on weekdays, $38 on the weekend. The course is easily walked if you want to skip the modest cart fees and get some exercise. Those serious golfers with business in the Hartford area might consider bringing their clubs along, as Keney Park is a mere 17 minutes from Bradley International Airport. Those who already live in the Hartford area are especially lucky and should beat a path through the woods to Keney Park before the trees drop their leaves. Keney Park's designer, Devereaux Emmet, also designed Copake Country Club, just over the Connecticut line in New York State. 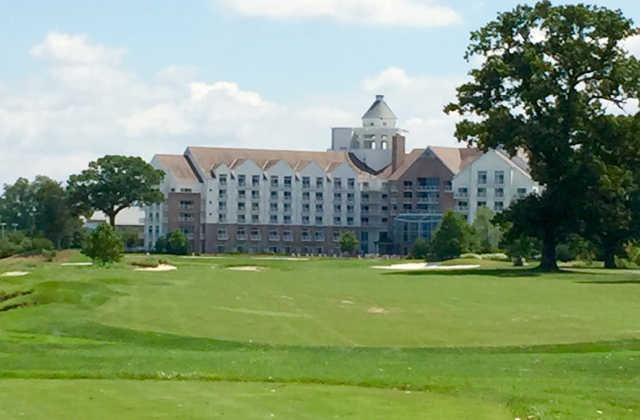 The friendly young man behind the pro shop counter said he was happy to extend the hotel guest rate of $89 to 10 of us at the River Marsh golf course at the Hyatt Regency in Cambridge, MD, last Thursday. 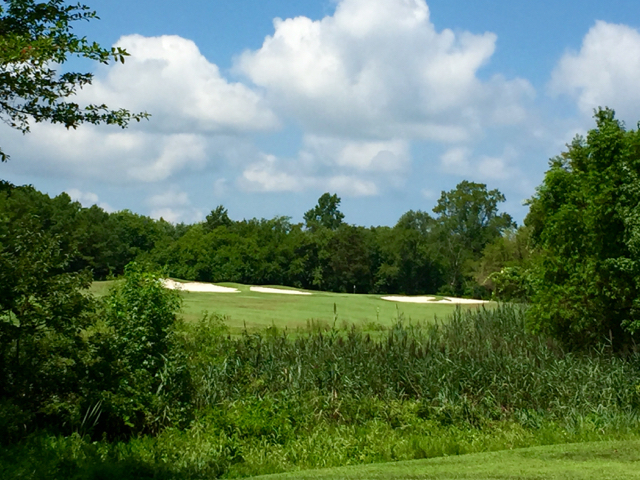 Although a bit pricey, I had read some nice reviews of the course, which was designed by Keith Foster and runs along the Choptank River on what is known as the Eastern Shore of Maryland. I figured the fee was relative to the layout and condition of the course. I was wrong. The green fee, apparently, was what the traffic would bear. I have no complaints about the River Marsh layout, which featured typically wide resort-course fairways but enough bunkering and marshland to keep things interesting and challenging. (It was reminiscent of a Tom Fazio or Rees Jones layout.) And the greens, though slow, were large, interestingly contoured and with smooth bent grass; more about the greens below. 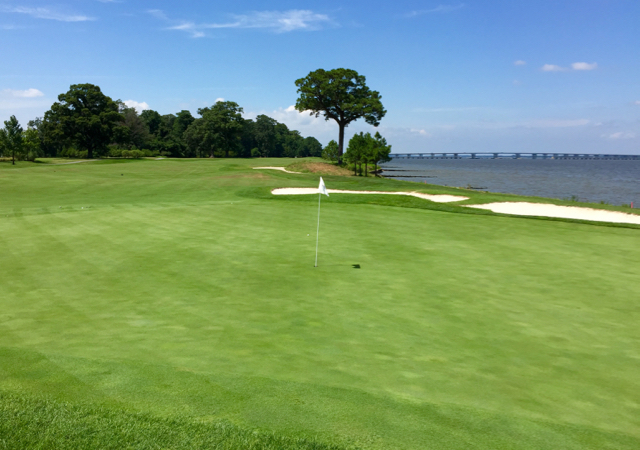 The River Marsh course at the Hyatt Resort in Cambridge, MD, is not without a nice view of the Choptank River or some challenging holes. But conditions on much of the course are not consistent with the $89 green fee. At 9 a.m., the employees in the area where the bags of clubs were supposed to be loaded onto carts seemed totally confused, as if a rush of people had showed up 30 minutes before the club was to open for play. Our group wound up loading its own clubs onto the carts 10 minutes before our tee time, even though three red-shirted resort employees were standing around, apparently discussing how to handle the four or five foursomes in the area. The practice range was closed because of heavy rain the night before; the small practice putting green was a bit ragged, especially around the edges, which we hoped would not be the case out on the course. Wrong again. You don’t expect the collars of greens at the peak of grass-growing season to be intermittently bare or marked by different grasses, but most of the edges of the greens on the course made replacing your ball a couple of feet away mandatory for a clean chip or putting path. All the greens looked as if they had been bombed with tiny cannon balls, such were the depth of the divots made by spinning approach shots onto the soft greens. Many of these pockmarks appeared to be at least a week old. Keith Foster designed the River Marsh course in what could be described as the manner of Tom Fazio, or Rees Jones. Greens with unrepaired ball marks are the burden of any resort course; infrequent players don’t understand or care about golf etiquette since it is not their golf course, and they do not feel the need to make the repairs for the golfers who follow. Shame on them, but that’s the way it is. Those confused and under-utilized employees at the bag drop could certainly be trained to fix ball marks toward the end of the day. But apparently, even in the height of the vacation season, the destination that calls itself a “Hyatt Golf Resort” doesn’t see the need to make the investment to justify its four-to-five-star rating on some web sites or its fairly lofty green fees. At one point I had to chuckle as I spied two supervisory looking people surveying the course in a cart, stopping along the way to point out one needed improvement or another. They easily could have been out there all day given the number of blemishes our group encountered. Golf courses suffering from problems with temporary turf conditions should consider a program of “dynamic pricing.” Professional baseball teams have taken to doing this, lowering their prices when the home team hosts a lousy competitor and raising them a little when a pennant contender is in town. In that regard, a condition-challenged course like River Marsh at the Hyatt should reduce its rates while the golf course is in iffy shape and raise them when it is restored. If that young man in the pro shop had said to me, “We are pleased to offer your group a special rate today,” I might be planning a return visit in the future. How special a rate? Something like $39 would have done the trick. Guests of the Hyatt Hotel received a discount on green fees. It should be greater. A friend and former customer invited me to play the Ralston Creek course at Daniel Island this past week. After two inches of rain the night before, the course was in outstanding condition, and except for a few flecks of mud on the ball on a few drives, we could have played the ball from its place of rest. The greens were smooth if a little thin on grass in a few places; like many golf courses up and down the east coast, greens are still recovering from the extraordinarily heavy rains of last October which made many greens virtually unplayable early this spring. The Rees Jones designed greens on the Ralston Creek course are enormous and undulating; the undulations provide a sense that putts break much more than they do, and most of my misses -- there were many -- were on the high side. What was most impressive about this latest visit to Daniel Island -- I try to at least drive through the "new urbanism" community once or twice a year -- were the number of homes under construction. After more than two decades, Daniel Island is now at the age that it can be described as "mature," but there seem to be a number of large undeveloped patches still available; along the golf course, homes were going up in between other established homes, a sure sign of a healthy market. Indeed, homes that were priced at around $300,000 when my wife and I started our drive throughs 15 years ago are now approaching list prices of $1 million. We noted on this year's drive through that three-story buildings were going up along the drive just before the entrance to Daniel Island Park, the upscale neighborhood of estate homes and the location of the Daniel Island Club (Tom Fazio designed the other 18 holes in the 36 hole complex.) We saw a sign for apartment leasing, stopped by the office and received a guided walkthrough of a few apartments in the community called Wharf Seven, which is being developed separately from the Daniel Island developer. The apartments were modern, well appointed and priced from $1,475 for one bedroom units, $2,065 for two bedrooms and $2,400 hundred for three bedrooms. Our guide did not know the answer to my question about whether there is a special arrangement for membership in the Daniel Island Club whose regular initiation fee is around $80,000. Yes, it is expensive, but I have always found the service in and around the clubhouse to be impeccable. One thing I had not seen before at any other club was a barber shop inside the men's locker room. 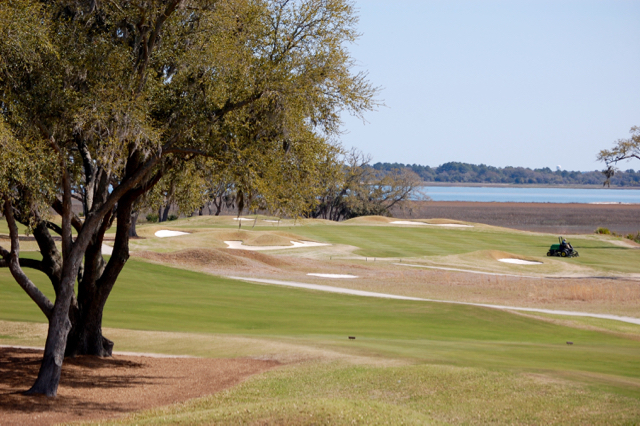 If you can afford it, Daniel Island membership offers excellent golf, lots of sshopping and other services right on the island, and the great city of Charleston just 20 minutes away. You never hear Litchfield Country Club, one of the oldest layouts of the 100+ in the Myrtle Beach area, mentioned in the same sentence as Caledonia, True Blue, Pawleys Plantation, Heritage or most of its other neighbor courses on the south end of the Grand Strand. Willard Byrd, Litchfield's designer, was regarded well enough to be hired dozens of times to create layouts that were not too challenging to interrupt the relaxation vibe for those many players on vacation in the area. But Litchfield can be deceptively challenging, especially if you play the course from tee boxes that leave you a middle iron, rather than a short one, into the modestly sized and fairly well protected greens. Two reasons compelled me to play Litchfield this past Thursday. First, it had just been named Golf Course of the Year by Myrtle Beach's golf club owners association, a nod, it seems, to the club's 50th anniversary year but still putting it in company with the above noted layouts, most of them past winners of the award. 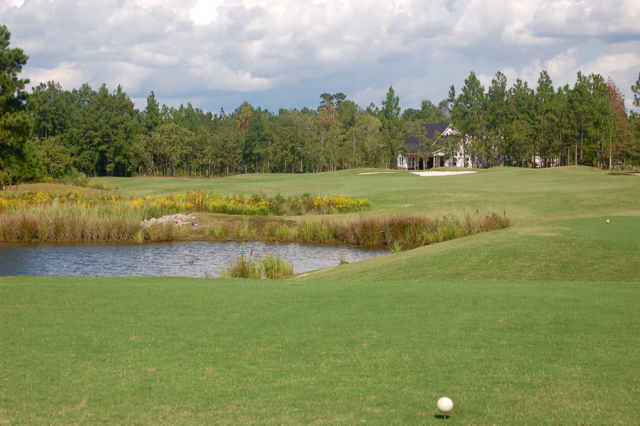 Second, Litchfield is one of the 22 local courses owned by Founders Group International, a China-based company that owns Pawleys Plantation Country Club, where I have been a member for 16 years. My membership provides me with discounted play at all other Founders clubs, including Grande Dunes, TPC Myrtle Beach, Willbrook Plantation and the River Club. My round at Litchfield was priced at just $33, cart included. I hadn't played the course in more than 20 years and thought I might engage in a little nostalgia with one of the original five in the Myrtle Beach area. It isn't until the finishing hole at Litchfield Country Club that water is in play in front of a green. Perhaps on a high from the recent award or well trained in the arts of customer service, the greetings at the bag drop and in the pro shop on a slow day -- I was the first tee time of the afternoon -- could not have been friendlier, the gentleman at the bag drop walking swiftly to meet me at the trunk of my car and grab my clubs ("What a beautiful day it is," he chortled) and the young man in the pro shop seeming genuinely happy to see me. I referenced the Travelers Championship that was playing on the television in the shop and told him I was from the Hartford area, and that I thought the tournament site, TPC River Highlands, was one of the most fun golf courses I have played. He shared that a former girlfriend's father was a member of TPC, but "I broke up with her before I could get on," he laughed. The starter, sitting in his cart beside the practice green, didn't seem happy to see anybody, probably because of hours of heat and humidity, but he did invite me to head to the first tee 15 minutes before my scheduled time. For five holes, I flew around the front nine but I caught the foursome of ladies in front of me on the sixth hole. After they departed, I played the back nine in 1 1/2 hours, even with frequent picture taking; I finished the entire round in under 3 1/2 hours, a blessing in the steamy heat. The majority of par 4s at Litchfield are doglegs, including the 363 yard par 4 6th hole. Those lakes also may have forced Mr. Byrd to route all the longer holes, and a few short ones, around them. 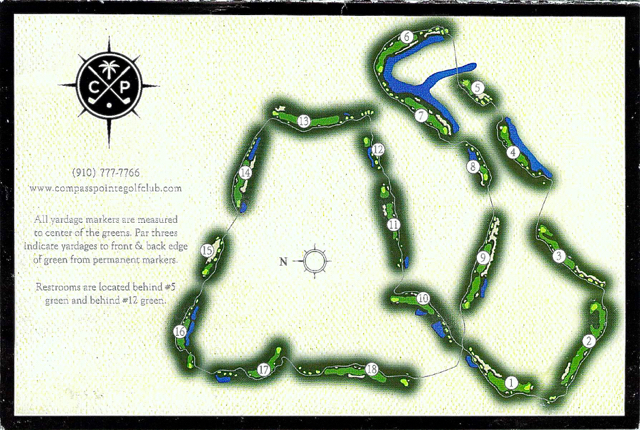 Four of the first six holes are doglegs, some of them severe. I thought I hit a nice drive down the right side on #2, bounding over a mogul at the corner. But the ball became stuck in the Bermuda rough, and when I attempted to hit a low hybrid shot below the live oak tree in front of me, I lofted the shot and it never came down out of the sprawling tree. Even one of the par three holes seemed to bend a little, necessitating the slight shaping of the tee shot. One thing I found a bit off-putting about Litchfield was the scorecard's handicap assignments to the holes. This classic course follows the classic, but outmoded, habit of assigning the toughest hole designations not by degree of difficulty but by length. Thus, the three toughest holes are all par 5s, all 500 yards or shorter, not the toughest holes on the course and, with two decent shots, leaving relatively easy birdie possibilities. Those designations belie the overall course rating -- 70.6 -- and slope of 128, making the Litchfield layout seem a bit out of line with what those numbers suggest. But, then again, Litchfield Country Club will not put you in a bad mood, whether you are on vacation in the area or one of the many members who live in the surrounding community. Mission accomplished, for designer and player. Note: Founders Group International's 22 courses are located in some of the best known golf communities on the Grand Strand of Myrtle Beach, from Long Bay and Aberdeen Golf Clubs close to the North Carolina border to Founders Club in Pawleys Island. If you would like information on real estate in any of these communities or an overview of real estate opportunities in the Myrtle Beach area, please contact me. There is never a fee or obligation for my advice. From my perch at Pawleys Plantation in Pawleys Island, SC, site of my family's vacation home, it appears the entire Myrtle Beach market has (finally) begun to rise again. Whipsawed by the 2008 recession that has lasted more than seven years, the real estate market along the almost 90-mile stretch known as the Grand Strand is showing strong signs of life. First, close to home, the dozen or so condos inside Pawleys Plantation that were priced from $129,000 to $200,000 just a year ago are gone; the lowest priced condos stretched along the 12th hole on the Jack Nicklaus golf course now start at $219,000. They are pretty standard 2 bedroom, 2 bath units just a one-minute walk to the marsh that looks out toward the homes a 1/2 mile away on the island itself, and about a five minute walk to the clubhouse and first tee of the golf course. These were priced below $200,000 when I visited earlier this year. TPC of Myrtle Beach, designed by Tom Fazio, is one of the 22 courses available at deep discount via the Prime Times Signature Card. 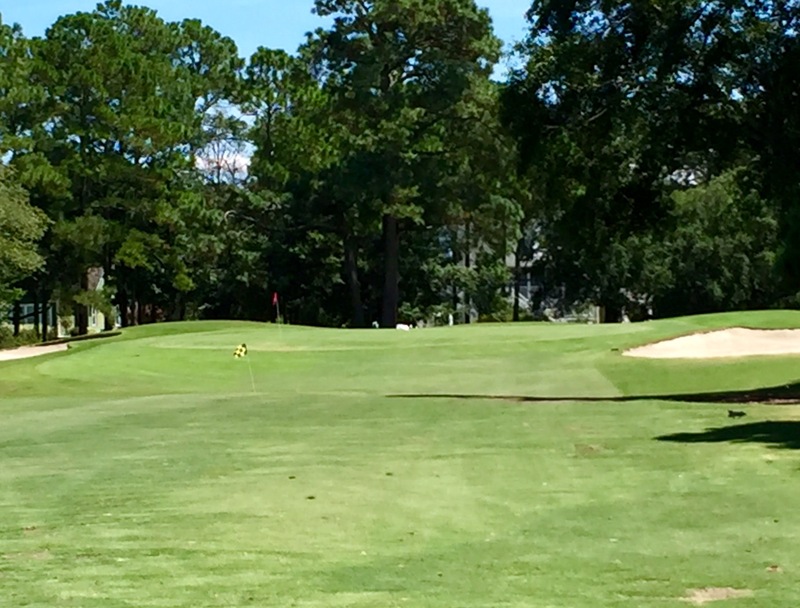 The south end of the Grand Strand of Myrtle Beach is home to arguably the best of the 100 golf courses along the 90-mile stretch. 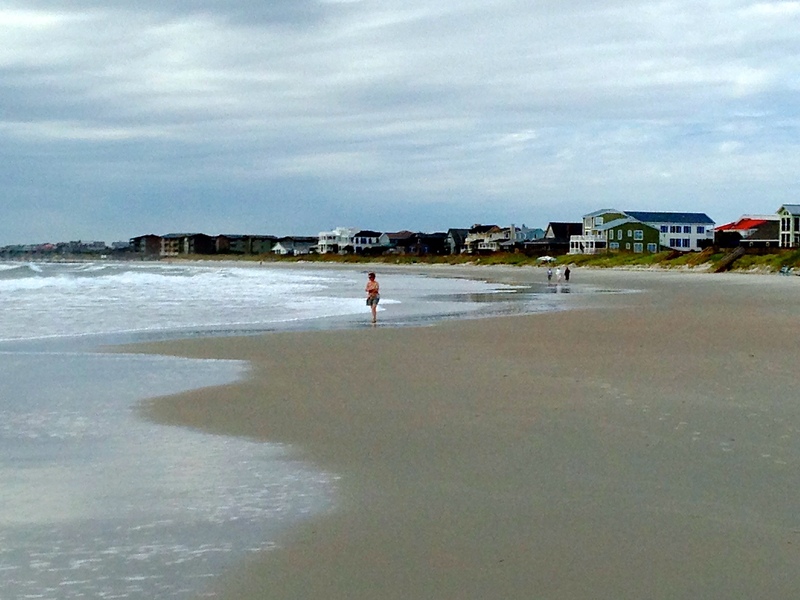 Beach area, accounts for the Pawleys Island area's popularity. Condos are a perfect investment for family vacations and provide a relatively inexpensive way to both have a good time and learn whether you might, at a later date, want to put down more permanent roots in the area. 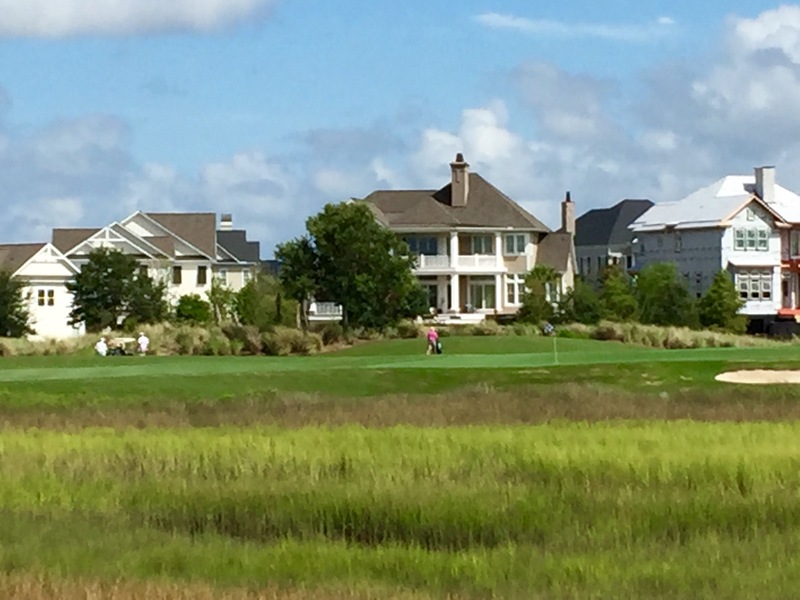 Pawleys Plantation, for example, is one of those golf communities with a balance of multi-unit condominiums (townhouses, some like to call them) and single-family homes, 900 dwellings in all. Only two holes -- the 11th and 15th -- are lined with condos and they are well enough beyond the field of play that one would have to try to hit them off the tees. Single-family homes are priced from around $300,000 for patio homes, typically 3 bedroom dwellings sited on a quarter acre or less. The beach on Pawleys Island, just three minutes from Highway 17, is clean and wide, a perfect place to wait for a family member to come back from some of the area's great golf courses. One other important feature about Pawleys Island and Myrtle Beach in general: A club membership is not necessary for a rich and happy golf life. There is still so much competition among the area's golf courses that prices are reasonable and many affinity memberships are available to those who like to play many different golf courses. For example, sign up for Prime Times Signature Card for $225 and you gain access to 22 golf courses in the Myrtle Beach area, with green fees discounted as much as 70% from the standard rates. If you play, say, just once a week throughout the year, you more than make your money back. The roster of courses, by the way, are among the best on the Strand and include Pawleys Plantation, Founders Club, TPC of Myrtle Beach, River Club and Litchfield Country Club, which was named this week Golf Course of the Year in Myrtle Beach by the area's golf club owners association. 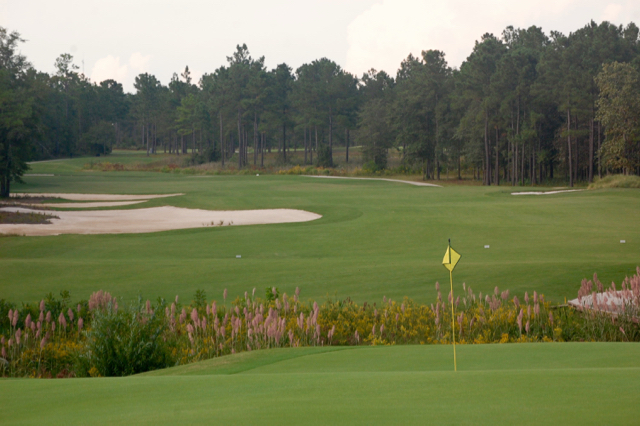 For those who are content playing repeatedly two of the best public golf courses in the east, let alone the Myrtle Beach area, the group that owns Caledonia Golf & Fish Club and True Blue Golf Club offer an annual membership with no initiation fees and dues of $1,900 per year. For courses that, in the high season, charge as much as $180 per round, the math (and savings) is easy. I am in Pawleys Island for the next couple of weeks and would be happy to answer any questions or check out any properties for those interested in a great place for a vacation or permanent home. (Contact me here.) And if you are planning a visit, I'd be pleased to make golf course and restaurant recommendations. There are plenty to choose.